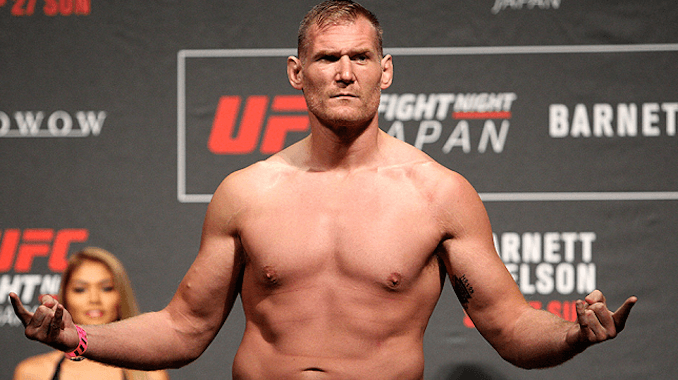 Josh Barnett has been cleared by USADA following an out-of-competition drug test failure in 2016, a preview of tonight's Invicta FC card in Utah, the main event for the UFC's return to Atlantic City, Sean O'Malley undergoes surgery and a bizarre finish to a fight on the LFA card. I proved my innocence as I stated from the beginning and now I can look towards getting back in the ring in the neat (sic) future. The time I lost though can never be regained. It should not havr (sic) had to come to all of this. Ever onwards. The Invicta FC card has received additional promotion due to UFC middleweight Elias Theodorou serving as a ring card boy for the fights tonight. It is a unique deal as Theodorou is allowed to wear several sponsors for his ring card outfit tonight, something he would not be allowed to do for his UFC fights. Theodorou received a lot of media attention for this because he is not doing it as a joke and it has led to several stories on Invicta that would not be out there if not for this unique idea. **A featherweight rematch between Frankie Edgar and Cub Swanson has been announced for the UFC’s return to Atlantic City, New Jersey on Saturday, April 21st. This is a quick turnaround for Edgar, who was knocked out for the first time in his career by Brian Ortega at UFC 222 on March 3rd. Swanson is also coming off a loss to Ortega from this past December and will look to avenge his November 2014 loss to Edgar, where Edgar submitted Swanson with four seconds remaining in their five-round bout. **A welterweight fight between Bryan Barberena and Jake Ellenberger was announced earlier this week by the UFC but is already off. The two were announced to fight at the UFC Fight Night card on Saturday, June 1st in Utica, New York, but it was reported by the MMA DNA outlet that Barberena will be unable to fight due to an injury. Ariel Helwani added that the fight was being discussed with the two parties but was never finalized when the UFC announced the bout on their website. **UFC bantamweight Sean O’Malley underwent surgery on his right foot on Friday, which nearly cost him his win against Andre Soukhamthath earlier this month at UFC 222. In the third round of their fight, O’Malley was comfortably ahead but was unable to put any weight on the foot and was on his back for the duration of the round with Soukhamthath getting on top of O’Malley and could not finish O’Malley, who won the fight by unanimous decision. **Combate has reported that a welterweight fight between Sean Strickland and Elizeu Zaleski has been added to the UFC 224 pay-per-view on Saturday, May 12th in Rio de Janeiro, Brazil. The fight brings the bout total to 12 on the show, which will also feature a bantamweight title fight between Amanda Nunes and Raquel Pennington and a middleweight between a pair of former 205-pound champions in Vitor Belfort and Lyoto Machida.